The Abbott government appears poised to fast-track the approval of plans to dump millions of tonnes of dredge from a coal port expansion onto internationally significant wetlands. Environment Minister Greg Hunt plans to assess the dumping of spoil from the proposed Abbot Point port expansion on the nearby Caley Valley wetlands under the Environmental Protection and Biodiversity Act using “preliminary documentation”. An onshore site was needed after international uproar over the original plans, which proposed moving spoil – about 3 million tonnes in total – to a site within the World Heritage-listed Great Barrier Reef. Senator Larissa Waters, the Greens’ environment spokeswoman, said it was “disgraceful” for Environment Minister Greg Hunt to opt for scrutiny that could be limited to merely desktop research. Queensland Premier Campbell Newman would be able to make the final call on the dumping proposal, she said. “The Abbott and Newman governments realised that the community was not going to let them dump dredge spoil into the Great Barrier Reef so now they’ve moved on to the second dirtiest option and are closing their eyes to its environmental impacts,” Senator Waters said. “The stunning, internationally significant Caley Valley wetlands are habitat to threatened shorebird species, a fish breeding ground and an important filter for water running into the Great Barrier Reef,” she said. “I am acutely aware of the level of public interest in the referrals and the community will have an opportunity to comment,” he said. Felicity Wishart, a campaign director for the Australian Marine Conservation Society, said the proposal “is going to flood the wetlands”. “We do have stringent laws but they are not going to be used to their full extent in this case,” Ms Wishart said. Dumping will effectively separate the salt- and freshwater regions, with bunds and a railway to be built on an embankment, Ms Wishart said. “They are playing with fire – we don’t know what we’re going to get”, as far as impacts, she said. Jeff Seeney, Queensland’s Deputy Premier, though, welcomed the decision that “allows us to progress our plan to re-use material dredged from channels at Abbot Point to enhance port development”. “Abbot Point has already been the subject of multiple and extensive environmental investigations and we will draw on those studies and new information requested to ensure this plan protects the Reef and enhances nearby wetlands,” he said. A spokesman for one of the two main miners behind the port plan, India-based Adani Mining, denied the assessment amounted to “fast-tracking”, given the approvals process had already taken “the best part of five years”. “Adani has long said that disposal options will adhere to the best practice and the best science, based on advice from technical experts and approving authorities,” the spokesman said. He described efforts by Greenpeace as “increasingly hysterical attempts” to disrupt vital export industries that would create 10,000 jobs and $22 billion in taxes and royalties for Queensland. Fairfax Media sought comment from the other main proponent, GVK, also India-based. Greenpeace said the wetlands were home to 40,000 water birds, many of them migrating annually to east Asia. 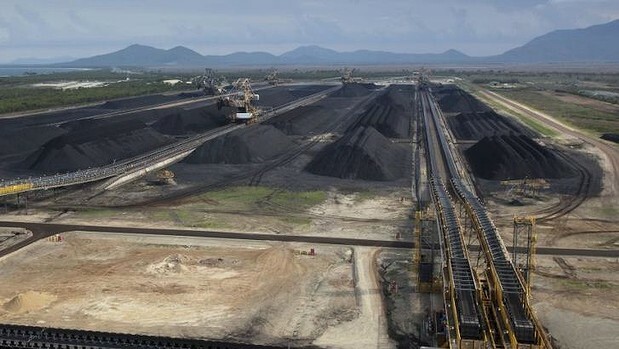 International campaigners have targeted Abbot Point and the related mega-coal mines in the Galilee Basin that will make use of the port’s expansion. The ventures may cost more than $25 billion, a total that may be difficult for proponents to raise amid weak coal prices and opposition from environmental groups. This week, these groups claimed more success in their campaign to discourage global banks from funding projects they say will create a huge new source of greenhouse gas emissions while undermining the World Heritage values of the Great Barrier Reef. All up, the mines could produce as much as 330 million tonnes of coal per year, creating more carbon dioxide than Australia’s current emissions. US-based banks, Citi and Morgan Stanley this week said they would not participate in financing the port expansion, while Goldman Sachs and JP Morgan indicated they would also avoid it. The Rainforest Action Network said on Wednesday it would target Bank of America in a bid to discourage it from involvement in the projects. Adani and GVK insist that their projects will proceed, rejecting claims that banks are steering clear of them. Adani said it expected to finalise a management contract on Wednesday for part of its $16.5 billion share of the projects. Ms Wishart, of the Australian Marine Conservation Society, said another concern is that the Queensland government wants dredging to be permitted for a longer period than originally planned. Instead of dredging during April and June to limit the plume, the proponents are now pushing for approval to dredge until October, Ms Wishart said. They also want to start dredging as soon as January – in the middle of the wet season. The Queensland government is seeking the changes “on behalf of the miners”, she said.